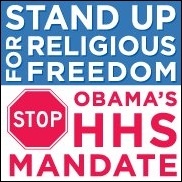 From the Pro-Life Action League: "Prayer is the foundation of all our efforts to fight President Obama’s HHS Mandate, which forces all employer health plans to provide free contraception, sterilization and abortion-inducing drugs, without regard to objections of conscience. Fr. Frank Pavone of Priests for Life has composed a Novena for this intention, which we are inviting all to pray in the days leading up to the big Nationwide Rally for Religious Freedom." Are blessed indeed, and will be comforted. That every law should reflect. Upon which it was founded.